Menzer Pehlivan, Ph.D., P.E., said she’s always been in a hurry. And that’s surely the truth. The geotechnical engineer from Turkey knows four languages, has a Ph.D., spent two years working in New York, was featured in a movie, and is now in the Seattle office of CH2M, one of the largest firms in the world. And all of that by the time she was 31. A rising earthquake engineer who’s passionate about a science that advances with each seismic shift, Pehlivan sees nothing but — and has earned nothing but — opportunity. 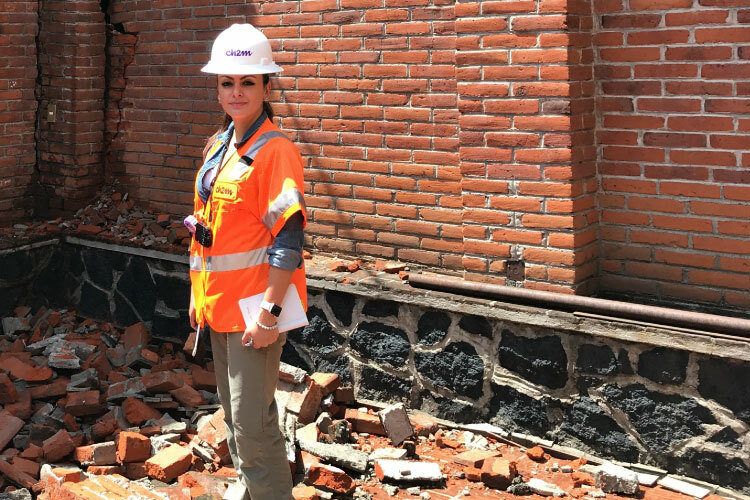 During a recent research trip to Mexico, where in September 2017 a 7.1-magnitude earthquake rocked the nation’s largest city, Pehlivan witnessed firsthand what good engineering, and the building codes they inspire, can do. While hundreds did perish in September — after rigorous codes had been installed — it was but a fraction of those who died there in 1985 when an 8-magnitude earthquake killed around 10,000. If Mexico City proved up to the challenge in September, the same cannot be said of many other parts of the world. In 2008, more than 69,000 died in Sichuan, China. In Haiti, as many as 160,000 died in 2010. And in Nepal in 2015 — a scene to which Pehlivan traveled for research — around 9,000 died. The list is long; the numbers are staggering. The geotechnical engineer’s work, it seems, is never done. Pehlivan said growing up she wanted to be an actress, but that changed after the early morning of Aug. 17, 1999, when the 7.8-magnitude Kocaeli earthquake struck about 200 miles northwest of Pehlivan’s hometown of Ankara, Turkey. The high-rise apartment building where she lived shook. The family poured out of the home, spent the night in their car, and awoke to the terrible news: As many as 17,000 people dead, another 40,000 injured, and 250,000 without a home. “I knew in 45 seconds what you could lose,” Pehlivan said, referring to this turning point in her life. But transitioning from dreams of Tinseltown to reality as an engineer took years. She earned her bachelor’s and master’s degrees in civil engineering from Middle East Technical University in Ankara by 2009. From there she went to the University of Texas at Austin, where she earned her Ph.D. in civil engineering in 2013. During and after her formal education, she was frequently published in peer-reviewed journals, and honed her public speaking with numerous presentations. Fittingly, a seismic event took place in the engineering industry, one that Pehlivan says will be beneficial for U.S.-based geotechnical engineers like herself. In August 2017, Jacobs announced the $3.2 billion acquisition of her employer, CH2M, the result being a mega-firm with about 74,000 people and a backlog of $27 billion. With a seemingly clear-cut path in front of her, Pehlivan has an excellent vantage point from which to see the industry and the science, and what they can do for mankind. So far so good — think Mexico City — but more can, and must, be done, Pehlivan said. As it stands, earthquake engineering is good at securing a structure so that people can survive a quake, but the building itself may no longer be viable. “I’m not telling you the building will be usable, but that you can get out safely,” Pehlivan explained. She wants to take it to the next level, beyond critical buildings like hospitals, to residential and commercial. “Build it in a way that the damage can be repaired,” she said, invoking keywords prevalent in engineering circles — resilience and redundancy. In developed countries like the U.S., where resiliency is underway all along the West Coast, and in Japan, which has some of the most rigorous building codes in the world, that’s possible. But in underdeveloped countries such as Nepal, or in cash-strapped nations like Iraq and Iran, where a border quake struck and killed hundreds in November 2017, resilience is much more difficult to attain. And Pehlivan admits as much. And while the body of knowledge is ever expanding, scientists and engineers have not figured out a way to predict exactly where and when a quake will erupt. As a result, people from Seattle to Istanbul are waiting on “the big one,” but have no idea when that time will come. A big distinction in the field lies with hazard versus risk. While some parts of the world might be at a high hazard for earthquakes, the risk might be low. This is the case in a sparsely populated area. The issue is complicated by high-population regions with dense cores and urban sprawl. Enter the earthquake engineers, the awareness they create, and the knowledge they bring to the table. “We cannot change Mother Nature, but we can improve our risk,” Pehlivan said. To expand the body of data, it’s necessary to head out into the field to collect real-world information that cannot be simulated in a laboratory. In her 2015 trip to Nepal, captured in a first-person account published in 2016 in Civil Engineering magazine, Pehlivan described her experiences as part of the team sent by the Geotechnical Extreme Events Reconnaissance Association. Along with the science and discovery — subsurface soils, infrastructure performance, slope stability problems, and surface ground motions — Pehlivan also described the joy of working with a diverse group of peers, the majesty of seeing Mount Everest towering up from the Himalayas, and the heartbreak of watching a family vacate its home. A big world for a big mind, right where Pehlivan wants to be. For earthquake engineering to truly be effective, people outside the industry need to be aware of what it can do for society. Codes need to be regularly updated, implemented, and the greater public — from national officials to local permitting agencies — need to be educated about resiliency and its benefits. “We know more now than when the infrastructure was built,” Pehlivan said, referring to the difference between what was, and what can be. A still photo from “Dream Big,” with Pehlivan using everyday items to demonstrate to children how engineers design and build earthquake-proof structures. Doing her part for awareness, Pehlivan participated in the 2017 movie, “Dream Big: Engineering Our World” (https://csengineermag.com/article/filmmakers-dream-big), which, among other things, is geared toward inspiring a new and diverse generation of engineers. Sponsored by Bechtel and the American Society of Civil Engineers, the film features Pehlivan and engineers Angelica Hernandez, Avery Bang, and Steve Burrows. So, if Pehlivan is now in the position to inspire dreams and to encourage people to follow them, it begs the question: How did she get to where she is? As a turning point, the Kocaeli earthquake is an obvious signpost. But in 1999, Turkey had a population of about 62 million people, so what made Pehlivan, one of millions of teens alive at that time, different than the rest? What made her envision a career that many might have thought beyond her reach? And what gave her the strength to pursue it? According to her, it all started with family. Her mother, Ulku, was a positive and powerful influence, as was her grandfather, Osman, who always told her, “Whatever you want to be, you’ll be great.” She took it to heart, and once she made up her mind to be a civil engineer, nothing, as time has proved, could stop her. The larger political backdrop was that Pehlivan came of age in the modernized Republic of Turkey, a secular state established in the early 1920s and for many years led by Mustafa Kemal, honorifically known as Ataturk, who brought equal political and civil rights to women and who opened thousands of schools. She has certainly brought that mindset to the U.S. An admitted “girly girl” with an abiding love of designer shoes, she can scamper in high heels, transition from casual to formal in a blink, do the salsa and the merengue, and in general, enjoys a jet-set life. One of her goals — already deep into the process of being achieved — is to shatter the stereotype that important engineers can only be men, and that women aren’t cut out for the work of building bridges and skyscrapers. She chronicles her social and business lives on her Instagram account, where she has more than 550 followers. Last fall, she appeared in Seoul, South Korea, where she spoke about research on seismic activity, and traveled to New Orleans, Chicago, Las Vegas, and Nashville. But beneath the glamour is the capacity for work and the drive to succeed. She proved to herself that anything was possible back in Austin while working on her doctorate. She dropped her hard drive in December 2012, losing all the data for her dissertation. Consternation, of course, but then she regrouped, recreating everything from scratch and finishing her studies by May 2013. “I lived in a 24-hour coffee shop,” she said of the effort it took to reproduce her doctoral thesis: Incorporating Site Response Analysis and Associated Uncertainties into the Seismic Hazard Assessment of Nuclear Facilities. While her friends and family back home might have been concerned, coming to the United States sight-unseen was never a problem for Pehlivan. Arriving on an extremely hot and humid day in Austin in 2009, she was ready for the adventure, even if her luggage had been lost in transit. Soon finding herself in an international circle of friends, UT-Austin more than sufficed as the place to hang her hat. “I was never homesick,” she said. In New York, when she worked in the Geo-Seismic Department at Mueser Rutledge Consulting Engineers, she lived on the Upper West Side — Lincoln Center, Central Park, Michelin-starred cuisine — and loved the city. But when an opportunity to work at CH2M presented itself, she left for Seattle. Considered by many a destination, the Pacific Northwest might just be a stop along the way for Pehlivan. For now, however, life with CH2M-Seattle is good — snowboarding in the Cascade Mountains, oysters on the half-shell right out of Puget Sound, world-class nightlife and cultural attractions, and plenty of professional challenges with important, complex projects. But for Pehlivan, is there something else out there other than a mega-firm and the opportunities it enables? Menzer Pehlivan, Ph.D., P.E., is a geotechnical engineer who specializes in the analysis of site response, liquefaction and other natural hazards, soil-foundation-structure interaction, probabilistic seismic hazard analysis (PSHA), and the seismic design of foundations for bridges, nuclear facilities, and other structures. She has been actively involved with pioneering research projects advancing the state-of-art and state-of-practice of geotechnical earthquake engineering. She holds bachelor’s and master’s degrees in civil engineering from Middle East Technical University in Ankara, Turkey, and a Ph.D. in civil engineering from the University of Texas at Austin. Tacoma All Hazards Vulnerability Assessment, Tacoma Water (Tacoma, Wash.) — Seismic evaluation of Hood Street facilities, Tacoma Pump Station, and Water Operations Building for the City of Tacoma. Performed geotechnical field investigations, site-specific seismic site response, and seismic hazard analysis. Rock Creek Reservoir Intake Replacement (Corvallis, Ore.) — Replacement of existing failing intake structure for the 4.5 million-gallons-per-day design capacity Rock Creek Water Treatment Plant. Performed deterministic seismic hazard analysis for the new intake structure. Puyallup River Flood Risk Mitigation (Puyallup, Wash.) — Feasibility study for potential flood risk mitigation measures in the Puyallup River Basin. Identified critical sections along 18-mile-long levee segments, performed stability analysis for proposed levee and flood wall sections, and evaluated preliminary liquefaction hazards. Anchorage Port Modernization Project (Anchorage, Alaska) — Developed representative dynamic soil profiles and estimated seismic ground motions via equivalent linear site response analyses. Seismic and Wind Investigation at RFK Bridge (New York City) — Estimated seismic ground motions and seismic design loads at the bridge piers, performed soil-structure interaction analyses for the bridge piers, and evaluated liquefaction potential and seismic-induced settlement at bridge piers. Seismic Engineering Services for Torre Reforma 432 (Mexico City, Mexico) — Performed site-specific PSHA, calculated seismic design ground motions, estimated soil-structure interaction effects, and evaluated seismically induced settlements at the site.